Christmas is sneaking up on us yet again, and whilst you’re busy tying the final bows in December deals and wrapping up business for the year, it’s important to remember the value of gift giving your customers. To ensure you remain on your customers minds well into 2019, show them you respect their interests. How? Empower every one of your customers to spend it well this Christmas with an M&S gift card. 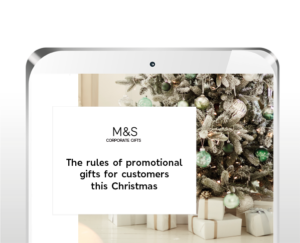 To find out more about retaining loyal customers with M&S Corporate Gifts, submit an enquiry or give us a ring on 0330 058 0734.